This was a wonderful treat from a new-to-me author. It’s a story about secrets, espionage, and revenge – with more than a little romance for good measure. From the start, secrets are everywhere. I spent the whole novel not quite knowing who to trust – never anticipating the many twists and often expecting subterfuge where there was none. Acacia is a fantastic main character and we spend much of the novel trying to figure her out. She’s ambitious, highly educated, and well connected but she holds her secrets close. I admired her intelligence and her independence. However, my one reservation about the novel is the way Acacia behaves erratically in her relationship with Nicholas – playing hot and cold and adding superfluous drama to an already tense and exciting story. I’m not sure I can write about any other characters or events without giving away key parts of the story. The storyline has been meticulously crafted and even the most innocuous details become important at some point. I love the pace and I love the tension in this book. I also love the sensual language used to capture the places, the artwork, and the people in this book. There are some truly beautiful passages that elevate this story beyond the usual romantic suspense. This is my first book by Sylvain Reynard, but it certainly won’t be my last. I’ve already purchased another of the author’s books to review for Wicked Reads’ BYOB in January. Nicholas is trying to figure out where he fits in the world. He has created a persona that exemplifies fierce, dangerous, and in charge. While he has trauma in his past, it's his future that we follow. Acacia is the embodiment of class. She doesn't let herself be a doormat, but she is also kind to anyone who she encounters. She is also running, but you don't really know from what. She tries very hard to resist Nicholas, but when things take a turn, she has nobody else. Nicholas and Acacia find themselves on a journey together but for very different reasons. I think that they have fairly organic chemistry – it isn't an instant love connection and it actually takes a lot of work for Nicholas to get Acacia to open up to him. As we follow their path, we discover so much about them individually that it makes them that much stronger together. I think that this was a good romance, but found that it was more of a mystery than anything. Not quite a who-done it, but it felt similar as there were so many people and situations throughout the story. Overall, I thought this was a very well written, developed story. Reynard is a consummate storyteller and this is another wonderful novel from the author’s pen. I cannot admit to how many times I have read the Gabriel trilogy, but I can say that this will also be added to my 'Must re-read' list. I read it from cover to cover without pause – well I think maybe a comfort break, but it was in the room with me! I was totally captivated by both Acacia and Nicholas, and as the layers upon layers were revealed, they became all the richer. This is a thriller, wrapped around a love story, inside a tragedy, or two. It is beautifully paced, and skillfully plotted. It is also incredibly passionate and intensely romantic. From the very first scene in the museum, the tension rises, and we are again under Reynard's spell. The revelations, which if handed out in the first chapter would shock and confuse, instead are given at a rate with which we can forgive, understand, and even rejoice. Highly recommend this lovely story – but make sure you have a free window, as once you start... you will not want to stop. I am honoured to have had my novels appear on the New York Times and USA Today Bestseller lists. I was a Semifinalist for Best Author in the 2011 and 2012 Goodreads Choice Awards. Gabriel's Inferno was a Semifinalist for Best Romance in 2011 and Gabriel's Rapture was a Finalist for Best Romance in 2012, in the Goodreads Choice Awards, as well. The final novel in The Gabriel Series, Gabriel's Redemption, debuted at #6 on the New York Times Bestseller list. It was a Finalist for a 2014 Goodreads Choice Award as Best Romance. Recently, Huffington Post Books ranked Gabriel's Inferno as the best teacher/student romance novel. 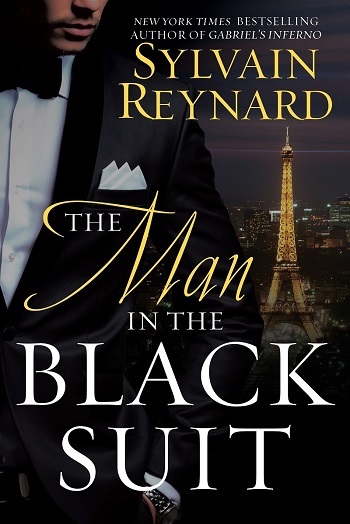 Reviewers on the Wicked Reads Review Team were provided a free copy of The Man in the Black Suit by Sylvain Reynard to read and review.